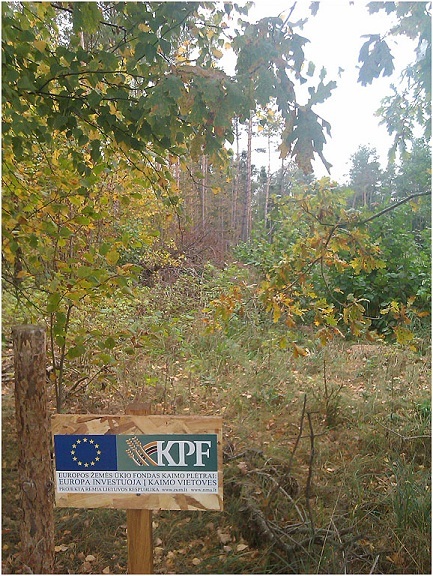 EAFRD has helped a land owner to restore the productive capacity of her forest area in central Lithuania that was badly damaged by a storm in 2010. Around 412 000 cubic meters of Lithuanian wood were estimated as being lost during the thunder storm of August 8th 2010. High winds reaped havoc in forests throughout the countryside, and woods around the village of Darsunickis in Kaisiadorys were badly affected. One of these forest plots in Darsunickis is owned by Daina Balasevičienė who received EAFRD support to help her restore her damaged forest. An important goal of this project was to ensure the restoration of the damaged forest and also to prevent forest fires and other environmental threats. The project work involved clearing the damaged area, restoring the forest, plus ensuring the preventive measures that would satisfy fire prevention and environmental requirements. This involved: cleaning and clearing 1.3 ha of damaged forest areas; and preparing the soil and replanting the damaged areas of the forest. The project has achieved its aim of restoring the forest's long-term productive capacity and addressed the environmental concerns caused by the storm damage. The land owner is not a professional forester and she inherited the woodland. Her project shows that RDPs have flexibility to support the rural development needs of a cross-section of different people.